This board is a breakout board for the DHT11 sensor and gives a digital output that is proportional to temperature and humidity measured. Extremely compact and light weight Digital Temperature Sensor, that use the famous Microchip's TCN75A sensor. It is capable of reading temperatures from -40°C to +125°C with a precision of 0.0625°C. This reflectance sensor can be used for edge detection systems and for making line following robots. This board carries the Allegro's ACS711ELCTR-12B-T hall effect-based ±12.5A linear current sensor, which offers a low-resistance (~1.2mΩ). 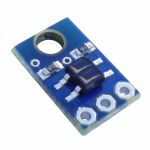 This board carries the Allegro's ACS714ELCTR-05B-T hall effect-based ±5A linear current sensor, which offers a low-resistance (~1.2mΩ) current path and electrical isolation up to 2.1kV RMS. GP2Y0D810Z0F is a distance measuring unit. The output voltage stays low in case an object exists in the specified distance range, so this sensor can also be used as proximity sensor. This ambient light sensor carries the TEMT6000 phototransistor, connected to a pull-down resistor to form a voltage divider that produces an analog voltage output between 0V and +5V as a function of the light detected in the visible spectrum.